Chill out, what're you yelling for? Ooh, chill out, what're you yelling for? You're trying to be cool, you look like a fool to me, tell me! Honesty and promise me I'm never gonna find you fake it, no-no! avril u rock really like you and like your all songs you r my favorite singer ever.. love u so much dear..
i love this song and i like avril she's my favorite singer we have the same name that is so cool!!!!! Awesomeeeee song AVRIL!!! V luv u!!!!!!! plz do release songz lyk dis evry month!!! muaahhh!! 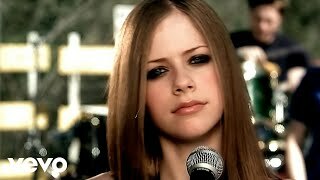 avril 4ever!!!!! Love is itself complicated, but we also make things complicated when we don't open up ourselves... pity... love this song! omg, havent heard this sonog in awhile..brings back the memories..why IS everything so damn complicated??? this song is really amazing it reminds me when i was in shcool alone and nobody's talk to me i just listen to this song and feel better with my self ilove you avril !!!! I LOVE this song. Unlike a lot of popular songs it is deep. I went through the same thing with one of my friends. thisss freakkkn sooonnngg suuukkkzzz booottttyyy!!!!!!! !ths soonngg isss onliii fer depressin ppl lyke yew guyz hahahah! !